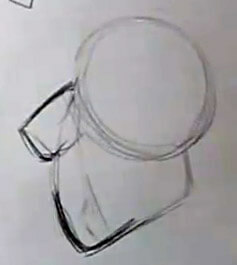 Want to know how to draw a cartoon face from the side? Because this is a cartoon drawing, we’re going to really push some of the features beyond where they would normally fall on the face. By now, you should be used to where the different features of the face go and how they relate to each other.So it’s time to start pushing things more in the cartoon direction! Start off with the circle for the major part of the skull and then push the jaw and nose further out than you would with normal proportions. There’s nothing too special to note here that you don’t already know how to draw other than how the drawing continues to evolve as new lines are added. 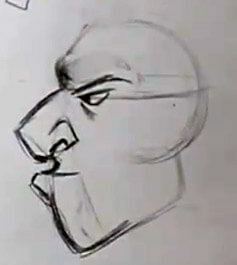 When learning how to draw a cartoon face from the side, it’s best not to think of any one line or curve in your drawing as being ‘sacred,’ meaning that it can’t be changed. Instead it’s best to think of it as an ever evolving collaboration of different parts. They all need to work together harmoniously to get a pleasing final result. If you compare this image to the one above it you can see how the design is evolving into a much stronger look than was initially created. This is achieved by strengthening the jaw, defining the brow to be a little sharper and also adding in a small little ear. 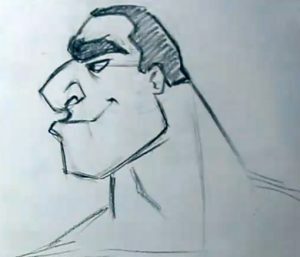 As you continue to learn how to draw a cartoon face from the side and experiment on your own, you will find all kinds of ways to get different feelings for your characters. Also when you are looking at other people’s character designs really break down the facial features into individual components and analyze them and consider how their shape deliberately changes the feeling of the character. For example – if you took the iconic character of Mickey Mouse and gave him smaller or pointier ears, what would that do to the feeling of the character? Add in the hair line, which should be fairly deliberate and angular, and then draw in the neck to finish off the drawing. Once you have the finished drawing like in the example, feel free to go back and experiment a little with changing up some of the features. 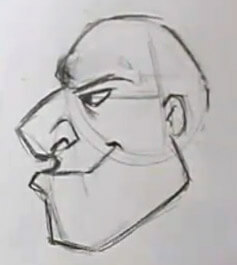 We hope you’ve learned a lot about how to draw a cartoon face from the side in this article. Why not share your work in our art community?